There are many places online where you can see manuscripts and early printed books of Chaucer’s works, but it is not always easy to know exactly what is available from any given resource. The links below will point you directly to individual manuscripts and books, but do remember to poke around the sites/ resources as well; there is much more to discover than I can list below. All the manuscript images on this page are from the collection of the British Library, and are deemed to be in the public domain. The shelfmark for each manuscript appears below the image, and you can click on the image to go to more information and pictures on the British Library site. The linked shelfmarks below should take you to the relevant images, but note that many online portals are in a perpetual state of redesign, and not all demonstrate best practices when it comes to permanent URLs. You may need to search the database, then, to find the manuscript: the shelfmark will usually suffice. Trinity College Cambridge has mounted full digitizations of many of its medieval manuscripts in the Wren Digital Library, including three Chaucer manuscripts. 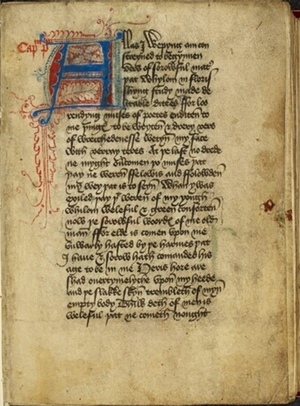 The University of Glasgow has several Chaucer manuscripts available, in part or in full. The British Library in London has selected folios from several of its Chaucerian manuscripts available in its online Catalogue of Illuminated Manuscripts. There are also complete digitisaations of three Chaucer manuscripts in the Library's Digitised Manuscripts site. 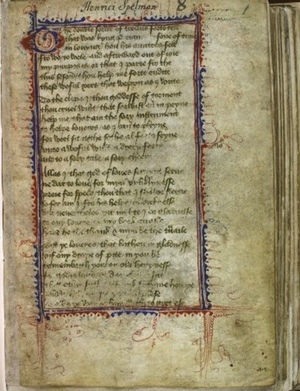 The British Library also has images from manuscripts related to Chaucer in some way. And finally, the British Library has a site where you can compare the 1476 and 1483 editions of the Canterbury Tales printed by William Caxton. Scroll further down this page for links to other early printings of Chaucer’s works. Treasures in Full: Caxton’s Chaucer is part of the larger Treasures in Full site, where you will find complete digital facsimiles of many famous books. 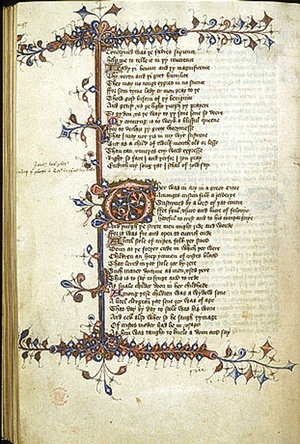 The John Rylands Library in Manchester has mounted complete digital versions of several Chaucer manuscripts, as well as of two early printings of the Canterbury Tales. There is also an image of the Retraction to the Canterbury Tales, written on the final leaf of a copy of Richard Pynson's 1492 printing. The Bodleian Library in Oxford has selected folios from quite a few of its Chaucerian manuscripts and early books available in its Digital Bodleian database. Some manuscripts from Oxford colleges are also included. The University of Texas at Austin has digitizations at the Harry Ransom Center, including of the Cardigan Chaucer (HRC 143). The Beinecke Library at Yale University in New Haven has complete digitizations of several Chaucer manuscripts and early books. Most of the early book digitizations are older, from black and white negatives; to the right I have listed only the newer material. 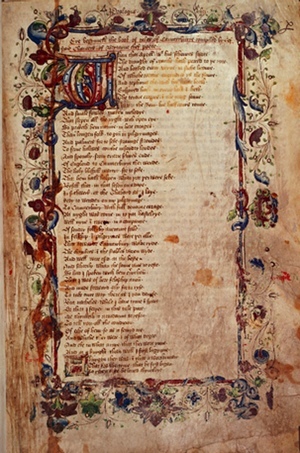 Columbia University in New York City has some images from early printed editions of Chaucer in its Digital Collections. For manuscripts from its collection, see the entry for the Digital Scriptorium, above. The Huntington Library in San Marino, California has several manuscripts relevant to Chaucer digitized through its Huntington Digital Library. The Folger Shakespeare Library has several images from early printings of Chaucer online. Click here for a search results page that includes a few images each from several early printings of the Canterbury Tales and the Workes; some are annotated. The Digital Scriptorium is a database of images from medieval manuscripts in the collections of libraries around the United States. 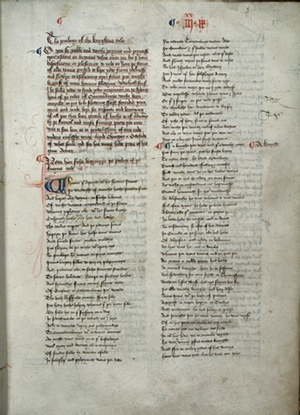 There are selected folios from several Chaucer manuscripts available here. Our library subscribes to Early English Books Online, a database of "page images of virtually every work printed in England, Ireland, Scotland, Wales and British North America and works in English printed elsewhere from 1473–1700." There are many early editions of Chaucer’s works in EEBO: to the right I list only a few of the books you might search for. Note that these are old digitizations from black and white microfilm, so that quality is not good. 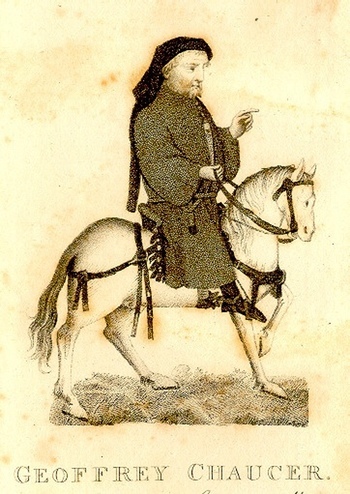 Google Books has many older printings of Chaucer’s works, as well as many adaptations, some with illustrations. Some examples are listed to the right: the links should take you to the information pages for the books in question. From there you can click on the icon to read the full text, and you can also, in some cases, download free e-book versions. Note that sometimes there might be other/ earlier editions of the books, but Google Books does not always have all editions of a book. Another good source for early printed books is the Internet Archive - these digitizations are sometimes of better quality than those in Google books, and you might prefer the interface. Try searching for Chaucer, or for some of the books listed to the right. ©Siân Echard. Not to be copied, used, or revised without explicit written permission from the copyright owner.